Melvin Newland, an Oklahoma minister, tells about a preacher friend of his who decided to keep track of all the questions he was asked and all the requests people made of him and the church for one week. Melvin left me hanging a little bit, because he didn’t reveal the result. I wondered what needs people were wanting met by the preacher and the church. The context of this verse is helpful in understanding Paul’s point. He is acknowledging the brethren’s generosity in supporting his ministry. The cared him for and met his monetary and physical needs. In fact, at one time the church at Philippi was Paul’s sole means of support. But Paul’s wasn’t worried about his needs being met. He had learned to be content. He had encountered many situations and circumstances in his life. He said, “I know how to be abased, and I know how to abound. Everywhere and in all things I have learned both to be full and to be hungry, both to abound and to suffer need” (Phil. 4:12). His strength to find contentment, peace and assurance was rooted in his faith in Christ. “I can do all things through Christ who strengthens me,” he confidently declared. It may be a bit difficult for many us in such a prosperous country as the United States to think about being in need. Yet, I have encountered situations where there was a imminent and pressing need. But it has always been met. I suspect many of you could say the same. Of course, not all needs are physical or material. We have emotional needs. Relational needs. Social needs. Intellectual needs. Spiritual needs. These many needs often converge to cause stress in our lives. In such cases remember that God promises to meet our needs. In his providence He can exercise His power to deliver the resources sufficient for every demand in our lives. Furthermore, when I follow the principles revealed in His Word, it’s amazing how “things seem to work out.” God knows our needs. 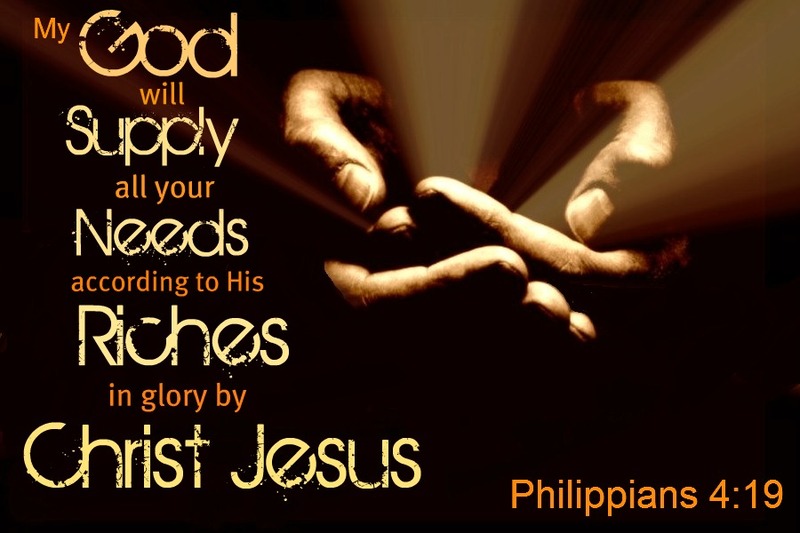 He supplies our needs. And provides every blessing for those needs to be met. Don’t fret. Or worry. Or complain. Thanks for reminding me of Gladys K. She was such a wonderful example and I was strengthened to know and be around her.